Select a Bible passage telling the Christmas story and divide it into equal parts for everyone. We chose Luke 2:1-20 for our party of nine. The sample above is #5 – Luke 2:11&12. Print from your computer or write out each selection on the white paper and number them so each person will know their turn. For a 7 inch star, write in a space roughly 3 inches square. 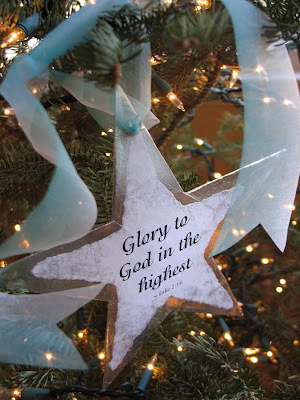 Also, write a verse for the front of all the ornament stars – we chose "Glory to God in the highest," from Luke 2:14. Cut out a 7 inch star from the cardboard. 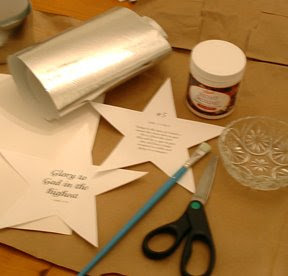 Then, cut small pieces of wrapping paper and decoupage them onto both sides of the star. Next, gently tear a star shape from around the text papers. 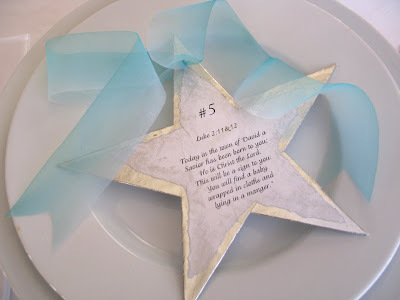 Decoupage those onto the center of each side of the silver stars and let dry. To give the paper more depth, use a small piece of sponge to softly apply silver paint from a stamp pad. Carefully dab it around the edges of where the white paper meets the silver. Finally, poke a hole in the top star point and string a ribbon through it. We left the ribbon open and curled on our dinner plate, then tied it onto a tree branch later with the reverse side of the star showing. Test the decoupage medium on a sample of your written or printed paper first, to be sure the ink won't run. On another note ... 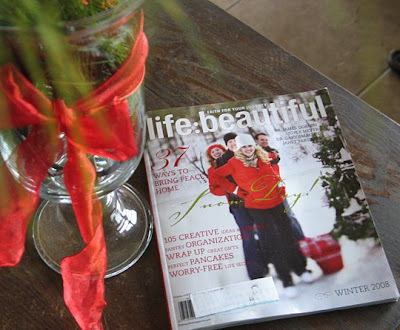 I received my winter issue of life:beautiful magazine this past week! Let's support this inspiring publication! Check it out!! Very inspiring (and beautiful) idea! P.S. I'm going to check out the life:beautiful magazine right now! I absolutely love the star idea to tell the birth of Christ-what a great way to start a family dinner. Thanks for sharing! What a beautiful inspirational idea! I love it. Thank you so much for sharing all these wonderful ideas. This will be an excellant project for the grand kids next year. Too much going on to make it happen this year. Sooo pretty...you are so creative! Merry CHRISTmas! I love the idea and I've been getting the magazine for a year! I can't believe I never see it in a store...It's wonderful! Thanks so much for the tip about Life:Beautiful! I picked up my copy today and LOVE LOVE it!! It's exactly what I have been hoping for! I love it when Christians are the trend-setters rather than the trend-followers! Very inspiring! Jeanne, You are amazing. I love following your blog and can't wait to try so many things from here. I love this idea!! And I finally found a copy of this magazine today--yea! Beautiful! Like it very much!